Why is lighter always better? Does light weight translate to performance in soccer? The fine folks at Nike seem to think so and who am I to argue, seeing as though they did invent Air. It has to be light, since ‘Ligera’ means lightweight in Spanish. It’s everything their campaign slogan “Light on touch, heavy in class” says. And it could be added “low on price” as it goes for a modest $134.99. When will Nike stop, when they make a boot out of clouds? 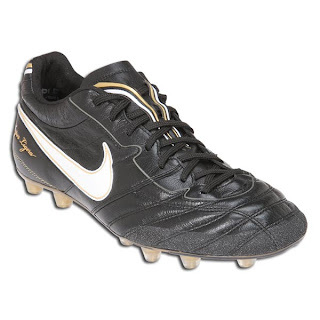 Well, they’re getting there, as the Super Ligeras are 25% lighter than their stylistic predecessors, the Tiempo Legends. If you feel a certain bounce to your game, that would be the kangaroo leather all over the upper, and the TPU (I’ll explain later) outsole will give you that good footing when you come down, dive, or get tackled. So, with all that lightness, surely it’s going to fall apart, right? No! Nike swears durability will by no means be compromised (meaning you won’t have to spend $134.99 every month) and have even given the boots, at great personal cost, a rubberized coating around the toe area to ensure it. That ought to make any player feel pretty secure. And like you would expect from a classically-styled boot, the Super Ligera offers a comfortable fit and excellent touch and feel. So elegant you could wear them with an Armani suit, if you were so inclined. I smell a promo idea. Interestingly enough, these boots were created for the Asian market and in particular, the Japanese Bukatsu player. No, I had never heard of Bukatsu either. Thus, I was forced against my will to do some online research and found that Bukatsu means. In Japanese, the word "bukatsu" describes after-school club activities, which are an institution in lives of all high school students. 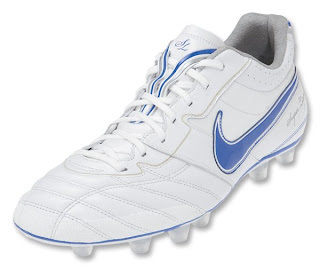 Therefore, when it came to the design of the Tiempo Super Ligera, Nike was interested in finding out first hand about the needs of the player. Many focus meetings conducted with Japanese Bukatsu groups later, they learned that these players needed — and wanted — a boot that was lightweight and soft. They estimated that players around the world would want similar things. But wait, there’s more: by studying wear tests, it was also determined that there was something else that they needed: durability. And that makes perfect sense, especially with the economy hurting, even in Japan. All the more so that these Japanese bukatsu players play from dawn to dusk, primarily on hard fields made of coarse, packed dirt, which, as you may surmise, are tough on boots. WARNING: The next paragraph is hard to understand, unless you’re a footy junkie or soccer boot designer, going into specific engineering details (obscure acronyms included) on how they made these shoes. And it sounds really cool. Designed on a new, Asian-specific footwear last, the Tiempo Super Ligera is wider than your typical soccer shoes (football boots for those outside the USA). It also has an extended throat to give the boot more versatility and variation. By identifying high-wear areas on the soccer shoes that the players used, Nike focused on these areas and screen-printed a layer of Nike Grind on those spots in order to protect the foot and strengthen the boot without adding weight. A gusseted tongue helps prevent irritation by preventing dust and sand from getting into the boot during play. Reflective elements were added in the upper for those games that take place at dusk. No daylight, no problem! The translucent studs reveal an inner plate injected with a TPU (Thermoplastic Urethane: It can be fine-tuned for optimal stiffness and is used to make stabilizing outsoles) that provides both strength and structure while imbuing the shoe with a lightweight aesthetic. At the Nike Sports Research Lab (NSRL), players’ motion was examined, and consequently a Longitudinal Flex Groove (LFG) was incorporated. The flex groove allows the foot to flex from side to side (sounds fun), while isolating the fifth metatarsal head (not so fun), where most of the foot’s power originates. Yes, they’ve thought of everything. Cloud boots are just around the corner.